On a steamy summer day, what would you rather be doing: relaxing by the water with a cold drink or moving to a new place? It doesn’t seem like much of a choice, right? Few people would choose the latter, but the weather can’t delay a move! While the show must go on, everyone’s health and safety must come first. Heat exhaustion is a serious condition that can develop from getting overheated. 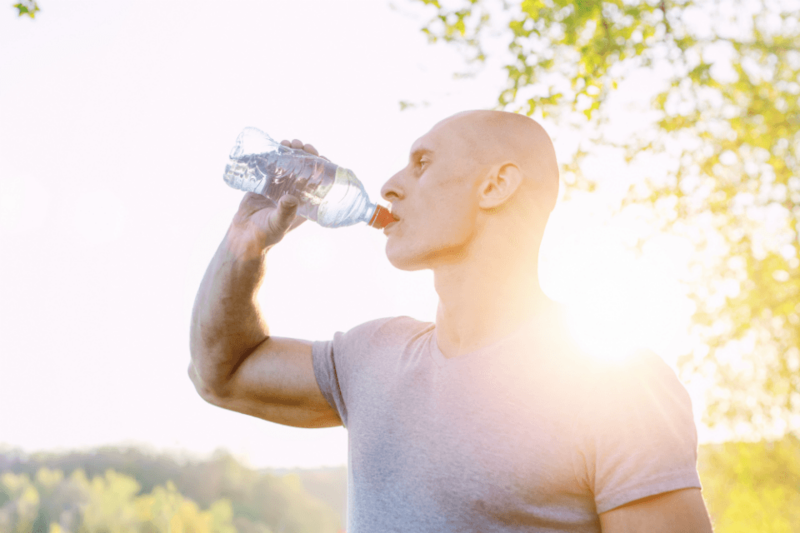 If you start to feel any symptoms of heat exhaustion – they include faintness, dizziness, nausea, headaches, and extreme sweating – stop what you’re doing and get to a cool, shady place. Be mindful that kids under 4 and adults over 65 are especially at risk of heat exhaustion. Keep everyone cool and comfortable during your summertime move using a few common-sense precautions. Moving day isn’t a fashion show, so dress with nothing but comfort and function in mind. Everyone involved with the move should wear lightweight, loose-fitting, breathable clothing that allows air to reach the skin. Jeans and long sleeves will trap sweat and make you feel hotter, so it’s best to avoid those. Wearing flip-flops and other slip-on sandals keep your feet cool but elevate your risk of tripping and stumbling, so opt for closed-toe shoes. On the day of the move, your new place will be crowded, jumbled and messy. None of that matters as long as it’s cool. By the time you and the movers reach the home, you’ll already be hot and tired. Walking into a hot space will worsen any symptoms of heat exhaustion. Send someone ahead to turn on the air conditioner, get fans running and put cold beverages and ice in the fridge. Avoid moving between the hours of 10 a.m. and 4 p.m. if possible. This is generally the hottest part of the day. In an ideal world, you’ll be in your cool new place and ready to start unpacking by the time the sun is high in the sky. Moving is complicated and distracting, so drinking water will probably be low on your to-do list. Rework that list and put hydration near the top, both for you and for everyone else involved in the move. Not drinking enough water makes heat exhaustion worse. Start the day by filling a few water bottles for each person. Set phone alarms if necessary to remind everyone to take regular sips. Of course, once of the easiest ways to stay cool during a movie is by not doing much of the moving yourself! Let experienced pros handle the work of moving while you focus on keeping your family cool. Delicate Moving is your ready moving partner in the Dallas-Fort Worth area. Call today for a free quote!